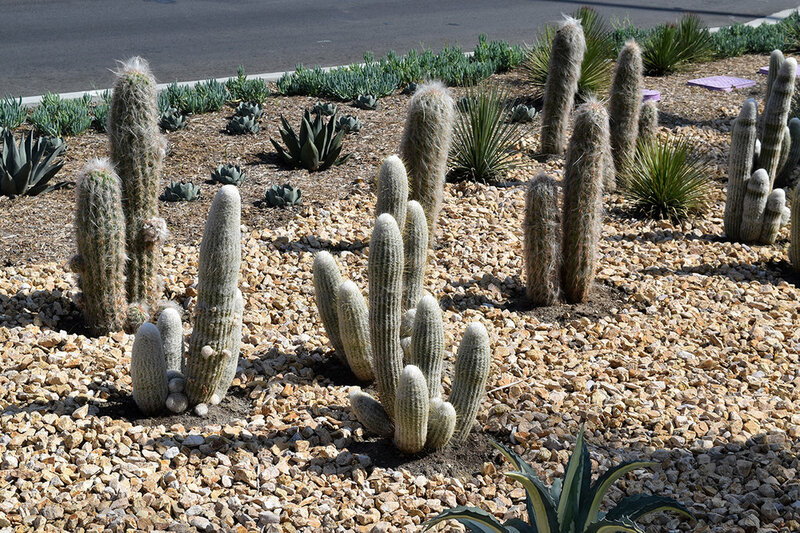 I first discovered the Historic Cactus Garden while taking my parents for a stroll through Beverly Gardens Park one afternoon. We were immediately smitten with this curious collection of desert dwelling plants and trees clearly planned out with an eye for color and good design. A lively, varied collection of ornamental cacti and succulents worthy of a botanical garden is presented here in the form of a remarkable public park. This desert garden seemed somewhat removed from the rest of the long stretch of park, which is primarily known for the iconic Beverly Hills sign and lily pond, just steps from the glamourous bustle of Rodeo Drive. Little did we know but the garden had only just recently reopened after undergoing a bit of “cosmetic surgery” in the form of a total redesign. Some of the larger trees and cacti that were removed during the process and then delicately replanted date back to the gardens inception in the early 1930s. Running along a busy block of Santa Monica Boulevard, the garden is comprised of three elongated raised beds with rough stone walls brimming with a rocky “soil,” both of a dusky reddish color. 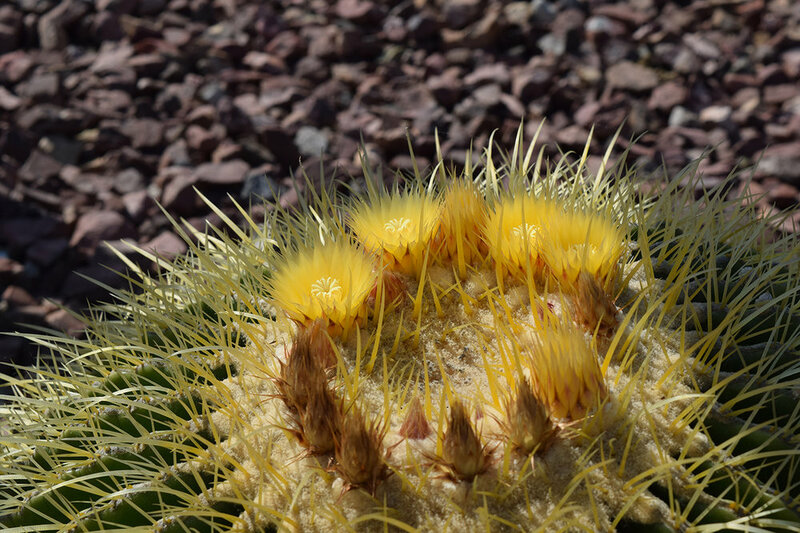 In each of these is a varying cast of expressive cacti in a range of sizes and odd shapes including stubby balls of barrel cactus, columnar cactus coated in white fur, and oversized conglomerations of prickly pear. My favorite was the snake-like tendrils of the “creeping devil” cactus planted along the garden’s perimeters, practically slithering over the edges of the stone walls. On both ends of the garden are groves of older trees that provide just about the only shade to be found on the bright sunny days I visited. On the western boundary stand an imposing grouping of Beaucarnea stricta with their engorged trunks giving them the understandable nickname of Elephant Foot Trees. Dragon Trees with dense branch clusters create the canopy of the eastern border garden under which short Madagascar Palms strike jaunty poses, with their spiny trunks and comically small fronds. An awkward and spindly bunch of tall stalks of euphorbia add even more levity to the already playful garden. >> Visit Beverly Gardens Park here!